We live in a world saturated with advertising. In the twentieth and twenty-first centuries, new technologies and new media have been created or adapted to deliver so many marketing messages to potential consumers that sometimes it has become impossible to recognize advertising when we encounter it. Other times advertising is blatant, obvious, and even infuriating as it infringes on the rest of our daily activities. Many of us tend to think of advertising as a modern invention, something that became ubiquitous in American life as a result of radio, television, and the Internet. Sometimes we assume that widespread advertising got its start in the twentieth century. The Adverts 250 Project, however, offers a different story of advertising in America. This blog features a new advertisement every day, an advertisement that appeared in a newspaper printed in colonial America exactly 250 years ago that day. Each advertisement is accompanied by short commentary providing additional context, explanation, and interpretation. I guide readers through the world of buying, selling, and promoting products in colonial America. On occasion, students from my Colonial and Revolutionary America courses at Assumption College join me as guest curators, bringing their own perspectives and curiosity to the project as they select and research everyday life as revealed in the advertisements. Although colonists placed advertisements for a variety of reasons, the Adverts 250 Project primarily focuses on commercial notices for goods and services in order to better understand how products were marketed in eighteenth-century America. 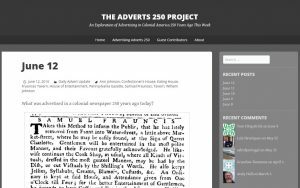 In comparing advertising then and now, the Adverts 250 Project often discovers that many of the strategies considered innovative today actually had precursors in the colonial era, such as limited time only sales and money-back guarantees. In addition, some standard marketing practices were already in place or being developed in eighteenth-century America. The Adverts 250 Project documents a variety of standard appeals–such as low prices and high quality and cutting-edge fashion–that continue to be central components of modern marketing. It also examines the origins of other familiar marketing strategies, including “Buy American” campaigns that emerged in the decade prior to the Revolutionary War. Colonists promoted merchandise they had made themselves instead of importing from England as a means of resisting Parliament’s abuses. On occasion, the Adverts 250 Project features other kinds of advertisements, including domestic squabbles revealed in runaway wife advertisements. Such advertisements appeared frequently. Husbands warned merchants and shopkeepers against extending credit to disobedient wives, sometimes prompting responses defending the wives. In an era before reality television or primetime dramas, readers followed complicated and messy family dynamics revealed in newspaper advertisements. Other advertisements from the period expressed frustration about thieves who stole merchandise from shops or listed the amenities included in houses or land for sale or announced what we would consider garage sales when colonists wished to get rid of things they no longer wanted or needed. Every advertisement tells its own story. The Adverts 250 Project connects modern readers to some of the stories told in the advertisements printed in colonial newspapers, demonstrating in the process that advertising has been a part of American life since before the Revolution. 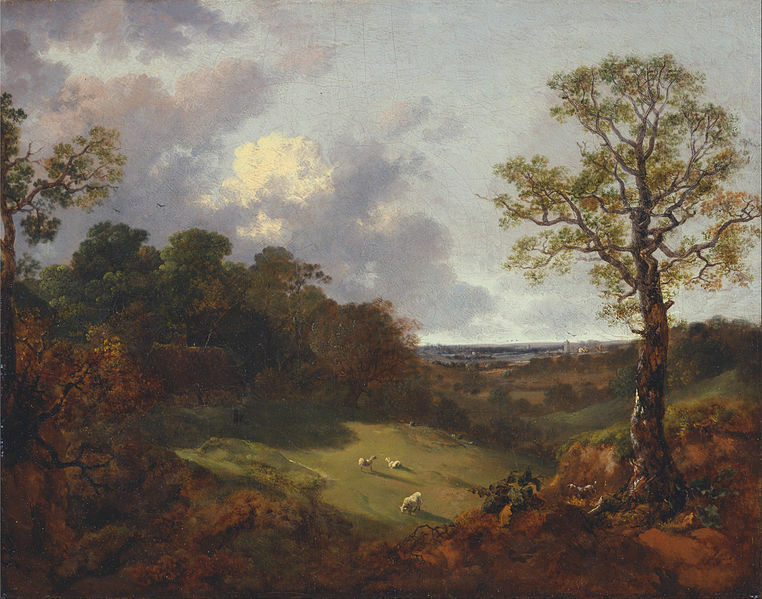 This entry was posted in Collections, Digital Humanities and 18th-Century Studies, Women's Lives in the 18th Century and tagged digital humanities. Bookmark the permalink. Carl Robert Keyes is associate professor of History and director of the Women’s Studies Program at Assumption College in Worcester, Massachusetts. He is in the process of revising a book about advertising in early America. He spends a lot of time examining newspapers and advertising ephemera at the American Antiquarian Society.